Meatballs are a classic favorite. 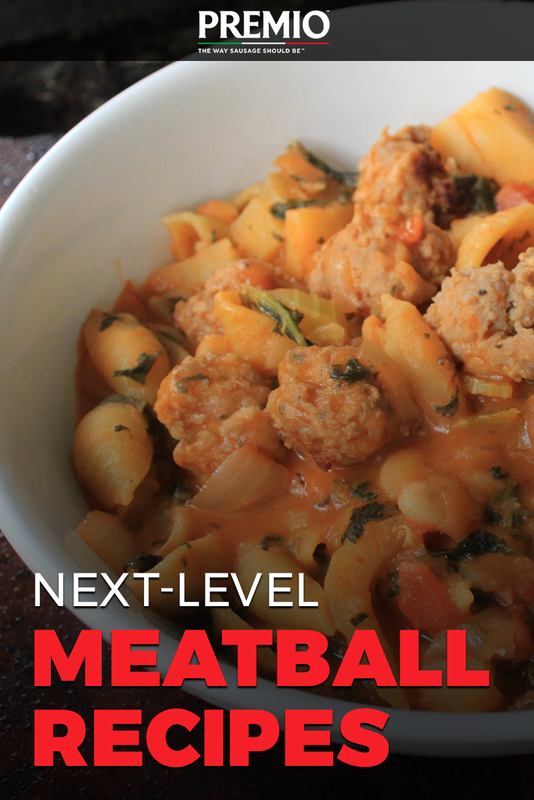 Whether it’s meatball sandwiches, spaghetti and meatballs or meatball soup, these delicious balls of protein and flavor have a special place in our diets and our recipes. Are you looking for an innovative way to try a new spin on your favorite ingredients? These unique Italian sausage recipes offer you an exciting way to experience classic meatball dishes with a twist. Try them today. Love meatball soup? Try this spicy Italian sausage twist. In a skillet over medium heat, cook your shaped meatballs until browned and cooked through, then drain and set aside. In a large pot, heat butter and oil, add onions, celery, carrots and garlic, and saute for about 5 minutes. Add chicken stock, tomato sauce and cooked meatballs, and bring to a boil. Turn heat to a simmer, add potatoes and tomatoes, and simmer for half an hour, occasionally stirring. Return broth to a boil, add kale and pasta and cook for 10 minutes until tender. Add cannellini and spices. Cook for an additional 10 minutes and serve warm. Looking for a healthier take on delicious meatballs? This chicken recipe will wow your taste buds. Preheat oven to 350 degrees (F), remove sausage meat from casings and roll into 16 small balls. Stuff each meatball with a mozzarella ball. Meanwhile, insert one slice of sweet red pepper into your uncooked, boneless chicken wings, then insert chicken wings into chicken meatballs as well. Place your stuffed meatballs on a cookie sheet, season with pepper and salt and bake for 35 minutes. Remove cooked meatballs from oven and serve with heated marinara sauce. Yum! Craving a delicious classic? This meatball-based take on sausage and peppers will have you scrambling for seconds. One at a time, pour water over bread slices, squeeze and tear into small bits to place in a mixing bowl. In the same bowl, mix cheese, egg, breadcrumbs and meatloaf; mix until thoroughly blended, then form into small meatballs and cook in a skillet with olive oil until all sides are browned. Drain and set aside, then saute pepper and onion strips in olive oil until lightly browned, adding salt and pepper to your tastes. Set aside. Lastly, cut your sausage into small pieces, add into the same frying pan and cook until almost completely browned and firm, then add meatballs, peppers and onions, cover and cook together on low for about 20 minutes until the flavors blend. Bon appetit! When you’re looking for the most flavorful take on meatball recipes with Italian sausage meat, Premio is the perfect source. Find our delicious sausage in a store near you today to get cooking.